Big Buck's inexerable march on the road to compiling the longest winning streak for a jumper in modern times continued in imperious fashion when winning the Rewards4Racing Cleeve Hurdle at Cheltenham. Should he claim a record-breaking fourth Ladbrokes World Hurdle back at the course in March - and he is only 1-2 with the sponsors to do so - then Andy Stewart's extraordinary stayer will equal the mark of 16 set by Sir Ken back in the 1950s. This latest outing was a deviation to the tried-and-tested formula outlined by trainer Paul Nicholls, but owner Stewart preferred to see Big Buck's on the track rather than wound up for the Festival with a racecourse gallop and a stronger routine at home. As had been the case on his previous start in the Long Walk at Ascot, the 1-4 favourite was given a minor shake-up by David Pipe's emerging grey Dynaste, who surged to the front at the top of the hill and prompted Ruby Walsh to ask his horse to exert himself. There is an inevitability about Big Buck's that he will pick up anything bold enough to challenge him and he drew level at the final flight and eventually pulled seven lengths clear. Stewart said: "Instead of giving him a racecourse gallop, we thought we'd come to Cheltenham so the public could see him, and I'm very pleased we did. It's great for racing and it gets everyone involved. "He's reached 15 now, so hopefully he will make it 16 at the Festival. (Owner) Dai Walters says Oscar Whisky is going to take on Big Buck's on the Thursday at the Festival, so I look forward to that." Walsh added: "He's won £28,000 for coming here, so it's more than you'd get at home. It's the recession you know! "He's never flashy, but he just keeps going. I've never ridden a jumper that has won so many races in a row, and I'm unlikely to ride another one. They were going a good gallop and upped the tempo in front, and I knew if they could keep that going they'd be very good horses." Nicholls said: "If we won today it was great, but if we lost I was the one who was going to get shot. 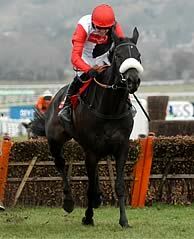 There's a lot of pressure with him, but he's just a brilliant horse. The good thing about this is that I can freshen him up a bit now without having to be so hard on him at home."